Allan Hills 84001 (commonly abbreviated ALH84001) is a Martian meteorite that was found in Allan Hills, Antarctica on December 27, 1984, by a team of U.S. meteorite hunters from the ANSMET project. Like other members of the group of SNCs (shergottite, nakhlite, chassignite), ALH84001 is thought to be from Mars. However, it does not fit into any of the previously discovered SNC groups. On discovery, its mass was 1.93 kilograms (4.3 lb). 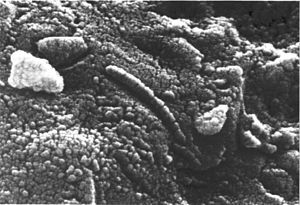 In 1996, a group of scientists claimed to have found evidence for microscopic fossils of Martian bacteria in the meteorite, culminating in then U.S. president Bill Clinton giving a speech about the potential discovery. These claims were controversial from the beginning, and the wider scientific community ultimately rejected the hypothesis once all the unusual features in the meteorite had been explained without requiring life to be present. Despite there being no convincing evidence of Martian life, the initial paper and scientific and public attention caused by it are considered to be turning points in the history of the developing science of astrobiology. This rock is considered to be one of the oldest Martian meteorites, proposed to have crystallized from molten rock 4.091 billion years ago. Based on chemical analyses, it is thought to have originated on Mars from a period when liquid water existed on the now arid planet's surface. In September 2005, Vicky Hamilton of the University of Hawaii at Manoa presented an analysis of the origin of ALH84001 using data from the Mars Global Surveyor and Mars Odyssey spacecraft orbiting Mars. According to the analysis, Eos Chasma in the Valles Marineris canyon appears to be the source of the meteorite. The analysis was not conclusive, in part because it was limited to areas of Mars not obscured by dust. The theory holds that ALH84001 was blasted off from the surface of Mars by a meteor impact about 17 million years ago and fell on Earth roughly 13,000 years ago. These dates were established by a variety of radiometric dating techniques, including samarium–neodymium (Sm–Nd), rubidium–strontium (Rb–Sr), potassium–argon (K–Ar), and carbon-14. Other meteorites that have potential biological markings have generated less interest because they do not contain rock from a "wet" Mars. 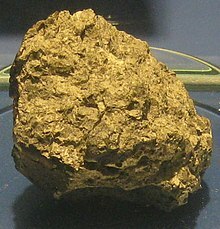 ALH84001 is the only meteorite collected from such a time period. In October 2011 it was reported that isotopic analysis indicated that the carbonates in ALH84001 were precipitated at a temperature of 18 °C with water and carbon dioxide from the Martian atmosphere. The carbonate carbon and oxygen isotope ratios imply deposition of the carbonates from a gradually evaporating subsurface water body, probably a shallow aquifer meters or tens of meters below the surface. On August 6, 1996, David S. McKay of NASA published in an article in Science claiming that the meteorite may contain evidence of traces of life from Mars. Under a scanning electron microscope, structures were revealed that some scientists interpreted as fossils of bacteria-like lifeforms. The structures found on ALH84001 are 20–100 nanometres in diameter, similar in size to theoretical nanobacteria, but smaller than any cellular life known at the time of their discovery. If the structures had been fossilized lifeforms, as was proposed by the so-called biogenic hypothesis of their formation, they would have been the first solid evidence of the existence of extraterrestrial life, aside from the chance of their origin being terrestrial contamination. The announcement of possible extraterrestrial life caused considerable controversy. When the discovery was announced, many immediately conjectured that the fossils were the first true evidence of extraterrestrial life—making headlines around the world, and even prompting the President of the United States Bill Clinton to make a formal televised announcement to mark the event. David S. McKay at NASA argued that likely microbial terrestrial contamination found in other Martian meteorites does not resemble the microscopic shapes in the ALH84001. In particular, the shapes within the ALH84001 look intergrown or embedded in the indigenous material, while likely contamination does not. While it has not yet conclusively been shown how the features in the meteorite were formed, similar features have been recreated in the lab without biological inputs by a team led by D.C. Golden. David McKay says these results were obtained using unrealistically pure raw materials as a starting point, and "will not explain many of the features described by us in ALH84001." According to McKay, a plausible inorganic model "must explain simultaneously all of the properties that we and others have suggested as possible biogenic properties of this meteorite." The rest of the scientific community disagreed with McKay. In January 2010, a team of scientists at Johnson Space Center, including McKay, argued that since their original paper was published in November 2009, the biogenic hypothesis has been further supported by finding three times the original amount of fossil-like data, finding more "biomorphs" (suspected Martian fossils) inside two additional Martian meteorites, as well as more evidence at other spots in the Allen Hills meteorite itself. However, the scientific consensus is that "morphology alone cannot be used unambiguously as a tool for primitive life detection." Interpretation of morphology is notoriously subjective, and its use alone has led to numerous errors of interpretation. The structures resemble some modern terrestrial bacteria and their appendages. Though some are smaller than any present day Earth microbes, others are of the order of 100 - 200 nm in size, within the size limits of nanobacteria and some are up to 1 to 2 microns in diameter. The smallest ones are too small to contain all the systems of modern life. Some of the structures resemble colonies and biofilms. However, there are many instances of morphologies that suggested life and were later shown to be due to inorganic processes. The meteorite contains magnetite crystals of the unusual rectangular prism type, and organized into domains all about the same size, indistinguishable from magnetite produced biologically on Earth and not matching any known nonbiological magnetite that forms naturally on Earth. The magnetite is embedded in the carbonate. If found on Earth it would be a very strong biosignature. However, in 2001, scientists were able to explain and produce carbonate globules containing similar magnetite grains through an inorganic process simulating conditions ALH84001 experienced on Mars. It contains polycyclic aromatic hydrocarbons (PAHs) concentrated in the regions containing the carbonate globules, and these have been shown to be indigenous. Other organics such as amino acids do not follow this pattern and are probably due to Antarctic contamination. However PAHs are also found in asteroids, comets and meteorites, and in deep space, all in the absence of life. A workshop on the limitations of size of microbes in 1999 found that though modern nanobacteria can't be smaller in volume than the interior of a sphere of diameter 250 ± 50 nm, primitive microorganisms based on a single-polymer system could be. They cite the example of RNA based life, with ribozymes (catalytic RNA) taking the place of the much larger ribosomes as enzymes for cell replication. The cells also wouldn't have proteins and would have no need to translate DNA to mRNA. The result could be cells as small as a sphere 50 nm in diameter. These RNA World cells are one of the suggestions made to bridge the gap between abiotic chemistry and modern cells. They could be based on biological systems different from the ones we understand (such as the RNA World cells). The RNA world hypothesis is still under consideration, with chemist Steven A. Benner and physicist Paul Davies supporting it in a chapter of the book "Frontiers of Astrobiology" published in 2012 by the Cambridge University Press, in the chapter "Towards a Theory of Life"
Deception Point – fiction related to ALH84001. ^ a b c "Meteoritical Bulletin Database: Allan Hills 84001". ^ "President Clinton Statement Regarding Mars Meteorite Discovery". www2.jpl.nasa.gov. Retrieved 17 March 2018. ^ a b c d e f g h Crenson, Matt (2006-08-06). "After 10 years, few believe life on Mars". Associated Press on USA Today. Retrieved 2009-12-06. ^ Lapen, T. J.; et al. (2010). "A Younger Age for ALH84001 and Its Geochemical Link to Shergottite Sources in Mars". Science. 328 (5976): 347–351. Bibcode:2010Sci...328..347L. doi:10.1126/science.1185395. PMID 20395507. ^ "Martian (OPX) Meteorites". The Meteoritical Society. Lunar And Planetary Institute. Retrieved 2014-05-07. ^ "Information on the Allan Hills 84001". The Meteoritical Society. Lunar and Planetary Institute. Retrieved 2014-05-07. ^ "The ALH84001 Meteorite". NASA. Jet Propulsion Laboratory. Retrieved 2014-05-07. Orange carbonate grains, 100 to 200 microns across, indicate that the meteorite was once immersed in water. ^ a b "Carbonates in the Martian meteorite Allan Hills 84001 formed at 18 ± 4 °C in a near-surface aqueous environment". PNAS. ^ "Birthplace of famous Mars meteorite pinpointed". New Scientist. Retrieved March 18, 2006. ^ a b c d e "Evidence for ancient Martian life" (PDF). ^ "How could ALH84001 get from Mars to Earth?". Lunar and Planetary Institute. LPI. 2014. Retrieved 2014-05-07. ^ Nyquist, L. E.; Wiesmann, H.; Shih, C.-Y. ; Dasch, J. (1999). "Lunar Meteorites and the Lunar Crustal SR and Nd Isotopic Compositions". Lunar and Planetary Science. 27: 971. Bibcode:1996LPI....27..971N. ^ Borg, Lars; et al. (1999). "The Age of the Carbonates in Martian Meteorite ALH84001". Science. 286 (5437): 90–94. Bibcode:1999Sci...286...90B. doi:10.1126/science.286.5437.90. PMID 10506566. ^ McKay, David S.; Gibson Jr., E. K.; et al. (1996). "Search for Past Life on Mars: Possible Relic Biogenic Activity in Martian Meteorite ALH84001". Science. 273 (5277): 924–930. Bibcode:1996Sci...273..924M. doi:10.1126/science.273.5277.924. PMID 8688069. ^ McSween, H. Y. (1997). "Evidence for life in a martian meteorite?". GSA Today. 7 (7): 1–7. PMID 11541665. ^ Clinton, Bill (1996-08-07). "President Clinton Statement Regarding Mars Meteorite Discovery". NASA. Retrieved 2006-08-07. ^ Thomas-Keprta, K. L.; Clemett, S. J.; McKay, D. S.; Gibson, E. K.; Wentworth, S. J. (2009). "Origins of magnetite nanocrystals in Martian meteorite ALH84001" (PDF). Geochimica et Cosmochimica Acta. 73 (21): 6631–6677. Bibcode:2009GeCoA..73.6631T. doi:10.1016/j.gca.2009.05.064. Retrieved 2014-05-07. ^ a b "NASA – Press Release #J04-025". Nasa.gov. Retrieved 2012-03-29. ^ "Spaceflight Now | Breaking News | Three Martian meteorites triple evidence for Mars life". spaceflightnow.com. Retrieved 2019-02-15. ^ a b Garcia-Ruiz, Juan-Manuel Garcia-Ruiz (December 30, 1999). "Morphological behavior of inorganic precipitation systems – Instruments, Methods, and Missions for Astrobiology II". SPIE Proceedings. Instruments, Methods, and Missions for Astrobiology II. Proc. SPIE 3755: 74. doi:10.1117/12.375088. Retrieved 2013-01-15. It is concluded that "morphology cannot be used unambiguously as a tool for primitive life detection." ^ Agresti; House; Jögi; Kudryavstev; McKeegan; Runnegar; Schopf; Wdowiak (3 December 2008). "Detection and geochemical characterization of Earth's earliest life". NASA Astrobiology Institute. NASA. Archived from the original on 23 January 2013. Retrieved 2013-01-15. ^ Schopf, J. William; Kudryavtsev, Anatoliy B.; Czaja, Andrew D.; Tripathi, Abhishek B. (28 April 2007). "Evidence of Archean life: Stromatolites and microfossils" (PDF). Precambrian Research. 158 (3–4): 141–155. Bibcode:2007PreR..158..141S. doi:10.1016/j.precamres.2007.04.009. Retrieved 2013-01-15. ^ Size Limits of Very Small Microorganisms: Proceedings of a Workshop (1999). 1999. ^ Steven a. Benner; Paul Davies (15 Nov 2012). Chris Impey; Jonathan Lunine; José Funes (eds.). Towards a Theory of Life, in Frontiers of Astrobiology (Page 37). Cambridge University Press. ISBN 9781139789226. Mittlefehldt, D. W. (1994). "ALH84001, a cumulate orthopyroxenite member of the SNC meteorite group". Meteoritics. lpi.usra.edu. pp. 214–221. Retrieved March 18, 2006. Stephan, T.; Jessberger, E. K.; Heiss, C. H.; Rost, D. (2003). "TOF-SIMS analysis of polycyclic aromatic hydrocarbons in Allan Hills 84001". Meteorit. Planet. Sci. uni-muenster.de. pp. 109–116. Archived from the original on 2007-08-12. Sawyer, Kathy (2006). The Rock from Mars: A Detective Story on Two Planets. Random House. ISBN 1-4000-6010-9. Wikimedia Commons has media related to ALH84001. "NASA – The ALH84001 Meteorite". jpl.nasa.gov. "Allan Treiman's dissection of ALH84001 literature for the non-specialist". lpi.usra.edu.